Arizona State University appears in our ranking of the 30 Best Online Schools for Graduate Degrees. Arizona State University offers nationally and internationally ranked programs designed to prepare graduates who are innovators, partners, entrepreneurs, and free-thinkers. The programs offered at Arizona State University create graduates who are recruited by the top corporations in the country. 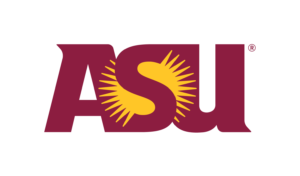 Arizona State University has developed a new type of American research University, one that is committed to excellence, access and impact. It is measured by who it includes not who it excludes, helping students succeed, advancing research while discovering value as well. In addition to traditional on-campus classes, Arizona State University also offers a wide range of degree programs online which provide the flexibility necessary for non-traditional students. The University offers more than 350 undergraduate and more than 450 graduate programs led by expert faculty. Students are provided an interdisciplinary approach to instruction which creates master learners. Graduate students work with top researchers in state-of-the-art facilities. In addition, graduate programs offer comprehensive support services to students enrolled in programs. In addition to traditional courses offered on the Arizona State University campus, the school also has a strong online campus as well. Students are able to earn degrees in such subjects as Digital Photography, Art History, Business, Internet and Web Development plus many more. The online school offers both undergraduate and graduate degree programs that offer a flexible format designed for working adults. Arizona State University began as the Territorial Normal School in 1885 but had it not been for the efforts of two men, John Armstrong, and Charles Hayden, it may have been located somewhere other than Tempe. During the 13th Legislative Assembly in Arizona Territory, politicians recognized the need for secondary and higher education. In addition to a university and a normal school, the legislators were tasked with creating a mental health facility. The mental health facility came with a $100,000 appropriation which meant towns fought hard to have it located in their jurisdiction. Armstrong was elected as a representative based on his platform of securing both the mental health facility and the university for Tempe. At the same time, Tucson was vying to have the capital moved back to their city from Prescott where it had been moved in 1878. Armstrong was appointed the chairman of the House Education Committee but his appointment was tempered by appointment of C.C. Stephens of Tucson to the Senate’s Committee on Education. Any bill to establish the normal school or university would have to pass both committees as well as the House and Senate. Armstrong realized that it would be difficult for Tempe to get both the mental hospital and the normal school as Tucson, who did not have enough votes to move the capital, was vying for the university against Phoenix. In exchange for supporting Phoenix as the location of the mental hospital, Armstrong built a coalition that supported Tempe as the location for the normal school. In 1885, the school was established in Tempe with the goal of teaching mechanical arts, agriculture and education. The school opened in 1886, the first institution of higher education to open in Arizona. A second Normal School was opened in Flagstaff in 1901 and the name of the Tempe school became the Tempe Normal School. In 1925, it became Tempe State Teachers college and in 1929, Arizona State Teachers College. The school became Arizona State College in 1945 and gained University status in 1955. Today, Arizona State University is ranked first in innovation by US News & World Report and Times Higher Education ranks it in the top one percent of the world’s most prestigious universities. US News & World Report also rank it as one of the best graduate schools in the country. High school students who have not earned college credit after graduation apply to Arizona State University as freshmen. They must complete either the ASU Application or the Common Application. The applications require a high school report which includes a recommendation from a guidance counselor as well as official transcripts. Official ACT or SAT scores are also required. The applications include essays which must be submitted. Applicants who have earned college credit after high school graduation must also submit either the ASU Application or the Common Application. The applications require submission of official transcripts from all colleges and universities attended. Depending on the number of credits transferred, official high school transcripts may also be required. Graduate applicants must meet minimum standards for consideration to enter graduate degree programs. They must hold a bachelor’s degree or higher from an accredited college or university and must provide official transcripts from all schools attended. They must have maintained a 3.0 GPA in the last 60 semester or 90 quarter hours of undergraduate work. Some programs require the submission of official test scores, interviews, portfolios or auditions. Applicants are encouraged to speak to an admissions counselor before applying. Full-time undergraduate tuition for Arizona residents is $10,822 per year and $28,336 for out-of-state students. Online tuition is $520 per credit hour for undergraduate courses. Graduate courses range from $522 to $1,397 per credit hour. In order to qualify for any financial aid, students must complete the Free Application for Federal Student Aid (FAFSA) and it must be renewed on an annual basis. Arizona State University began as a school to educate teachers while also providing instruction in mechanical and agricultural arts. Today, Arizona State University is a highly-regarded research institution providing students with the highest level of education.